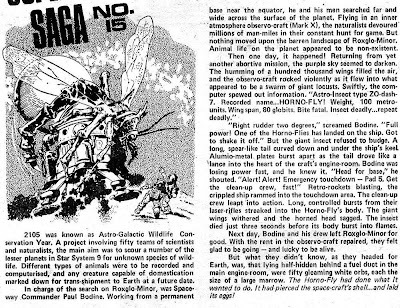 So folks, what’s the twist here – did the spacemen travel to a planet full of giant insects, or did their spacewarp magically shirnk them so that when they returned to earth the mosquitos merely seemed gigantic? 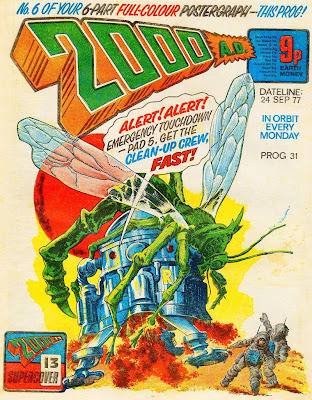 I’d suggest that they went to the future where radiation from nuclear war had caused all the insects to become gigantic, but they just did that twist, so it’s not too likely. Silk and Savage have headed for the hills, with a Volg divison hot on their heels! 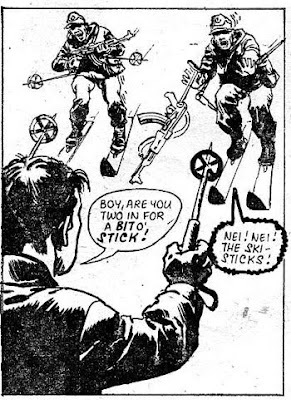 As ever the Mad Dogs are underequipped, wading through knee-high snow while ski troopers hunt them down, but they’ve got one thing on their side the Volgs don’t – British stubbornness and ingenuity! The rest of the Volgs finally stop and call in for some snow-cat backup, ready to crush down the wall of the chalet that Savage has taken refuge in. Putting that ingenuity to use once again, Savage notices a few sets of mountain lion tracks leading to the back of the building. He lures the snowcat back to the den, and the Nazis find themselves mauled by good old British Lynxes! With an appropriately ironic fate dealt to the snow-cat drivers, Silk and Savage head out once more, and finally link up with the Scottish resistance, who live in caves, well out of sight from the Volgan air patrols. Who knows what kind of mischief they’ll get up to with some backup? If this is true to form, the kind of disasterous mischief where a poor plan by the local commander gets almost everyone killed, and Savage has to rush in and save the dregs at the last minute. You know, it just occurred to me that we only ever got two secret messages for that code wheel. What the hell, Invasion? 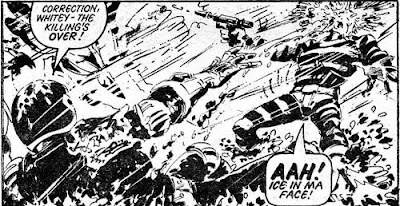 It’s time for another callback here at Judge Dredd – we just saw the fallout of the robot rebellion, and now we’re checking in with Whitey, the villain from Dredd’s first case way back in issue 2! When we last saw him he was left on Mega City 1’s ‘Devil Island’, a prison that stands above a massive highway intersection, where all the traffic runs at 200kph! Of course, if that traffic were to ever stop, you could just climb right down since, in an unusual move for a prison, Devil’s Island doesn’t have any walls or guards or sensors or anything like that to stop people from leaving. So it’s just a matter of Whitey getting the brain who works in the machine shop to build him a machine that can change the weather machine’s programming remotely. Suddenly the Big Meg sees its first snow-storm in decades! All over the city traffic grinds to a halt, leaving Whitey free to jump down onto a suddenly safe roadway. After killing his scientist friend, of course – Whitey can see no possible advantage in having dozens of people escaping at the same time. He thinks he’s got a better chance of getting away if he’s the one and only criminal on the loose. I’m beginning to see why he was so easy to catch in the first place. 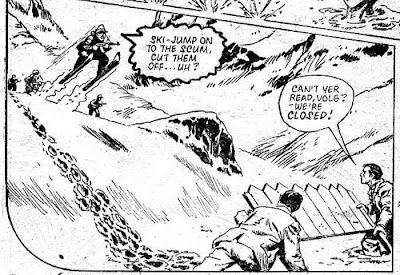 Dredd rushes to the scene of the escape, but his bike is useless in the snow… at least until he finds Whitey’s discarded chains, which he wraps around his tires for traction! Meanwhile Whitey has killed a guy and taken a woman hostage, so he’s not wasting any time with the whole ‘continuing evil’ thing. On his modified bike Dredd quickly catches up with Whitey, but Whitey proves too fast, managing to shoot Dredd in the arm with the gun he stole from one of the invisible guards while escaping. Apparently prison guard’s guns don’t have ID-locks the way judge’s guns do. I wonder why? Even though he’s a little injured, Dredd manages to defeat Whitey in the saddest way possible. Yeah, that was a snowball. How dispiriting. Dredd then switches the sunlight back on and takes Whitey back to Devil’s Island. Which means this was an entire Judge Dredd story where he didn’t kill anyone at all. Sigh. I was expecting something a little bigger from the Return of Whitey. Picking up the death count for the issue is Shako, who quickly slaughters every single person in the mess hall that he wandered into last time. Which just goes to show you – always carry a gun when eating lunch on a Russian spycraft. Shako doesn’t eat any of the soldiers, though – because he smells something much more delicious on the deck above. It seems that the Russian Spy Ship is disguised as a whaler, and there’s a prime sample of whale flesh on deck at the moment! Shako runs for the whale, in the process knocking a man down a chute into a vat of boiling blubber. Which is an extremely disgusting way to die. Ick. Now, that wasn’t the helicopter that Jake was on, so we’re not through with him yet – but Shako’s in trouble, since he’s still chained to the chopper as it heads to the bottom of the arctic sea! Things get weird for Dan this week, as his ship is approached by a fleet of heart-shaped spacecraft, all of whom broadcast messages of peace and love. They insist that Dan follow them back to their plane twhere they can be welcomed as honored guests, so long as they don’t bring guns. Dan’s wary, but convinced of the fake romans’ good intentions when he discovers that their planet’s main continent is actually shaped like a valentine heart! Once they’re down on the planet Dan learns the downside of hiring a group of disreputable criminals for your crew when two troopers attempt to chase after some hot roman tail rather than proceeding to the formal welcoming ceremony. Dan beats them up with a heart-shaped wall plaque, then heads to the dinner. While everyone else partakes of wine and song, Dan notices the two troublemaking crewman sneaking off with the ladies from earlier. Proving that he’s absolutely determined to keep people from enjoying themselves, Dan heads out after them, only to discover the two men lying dead in an alley… with their hearts torn out! It seems that the roman’s aren’t heart-obsessed because they’re so in favor of peace and love, but because they’re all vampires, who love devouring the hearts of their human visitors! How will Dan foil them now that his entire crew is drunk and stuffed with food – and let’s not forget that his ‘entire crew’ seems to be like twenty guys. Not really enough to deal with a planet of the vampires, is it? Guess we’ll find out next time! As I’m sure you’ll remember from last prog, John Probe was dispatched to Macon Coutny Georgia in order to find a crashed UFO – he succeeded in his mission, but before he could crack it open to find out what’s inside, he was waylaid by rednecks who, confusingly, think that the UFO is the work of the devil. Their plan? Use a bulldozer to lift up the UFO and put dynamite underneath it! Wait, if the UFO was in a place easily accessible by BullDozer, how was it so hard to find? Anyhow, Probe proves too strong for the BullDozer, but his show of strength convinces the rednecks that’s he’s some sort of Satanalien! Despite the fact that he just flipped a bulldozer with his bare hands, the Rednecks decide that they should try to take Probe on in combat. It goes really badly for them. Their leader is gutted with his own chainsaw and the gunmen are knocked over by thrown logs, but Probe can’t stop the last of them from detonating the dynamite that was left lying next to the UFO! That’s right – the dynamite was already wired to detonate, even before they’d gotten it in the place they wanted it. Not the best plan, but hey, they’re redneck. Much like all of their other decisions, the dynamite proves to have been a bad one – it ‘wakes up’ the UFO, which blasts all the remaining rednecks with a heat ray! Only Probe and Simon survive – Probe dispatches Simon to summon the government’s troop, while he himself explores the inside of the UFO, which now has a suspiciously open door. It proves somewhat disappoing, as all that remains of the crew seems to be some mush left on the floor. Were all the aliens splattered in the impact, did they escape, or is there a third, more terrifying answer? We’ll discover next time, because a distress signal beeping on the UFO’s dash has attracted reinforcements! You know, I’m a little disappointed by the lack of a twist. 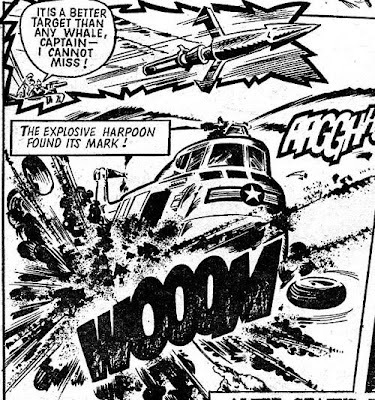 Also, I don’t know what a ‘Marrow’ is in the story’s context. It’s the 23rd century, and earth is dangerously overpopulated! We see the story through the eyes of a scumbag desperate to leave the planet and head to the ‘paradise planet’ that the global government has started advertising as a place where the overpopulated masses can take refuge! Tickets are free, but it’s first-come first-serve! So how’s our scumbag going to get one? It’s not a paradise planet at all! It’s a frozen wasteland, and like Australia before it, the government has decided that only scumbags will be tough enough to tame the wilderness, so they set up a system of going to the planet that assured only scumbags would get the tickets! Best Story: Dan Dare – I don’t think Dan Dare’s made a single appearance in this section since the death of the living axe, but what can I say? I enjoyed the planet of the vampires. Worst Story: Future Shock – Yeah, that wasn’t a very good twist, guys. Where was the alien zoo?